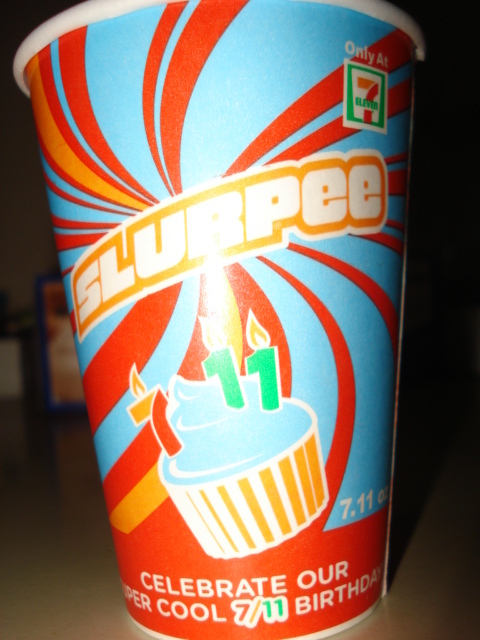 Today was 7-11-2011 and what better way to celebrate it than with a free small Slurpee courtesy of our local 7 Eleven franchise. When one adds to the fact that it was about 90 degrees in the shade today it made for a perfect side trip from my errands and something worthy of one of our Shopping Madness postings. Why not right? 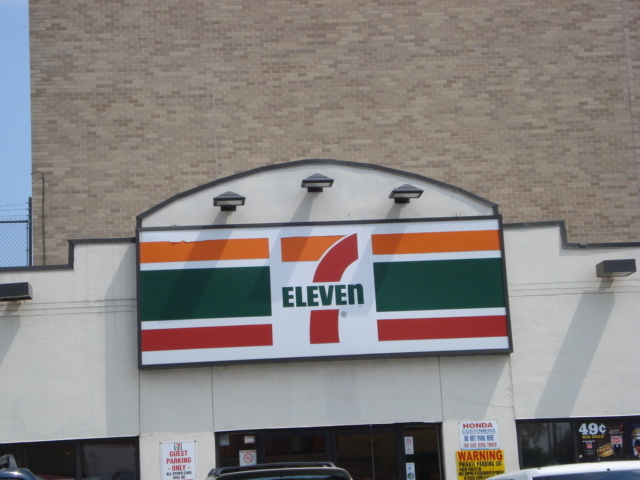 The PM.com HQ is located in close proximity to this store and while I had once wandered down to the one on 65th Street while looking for the KISS Cups, I was certainly not going to do that today. It was just too hot. 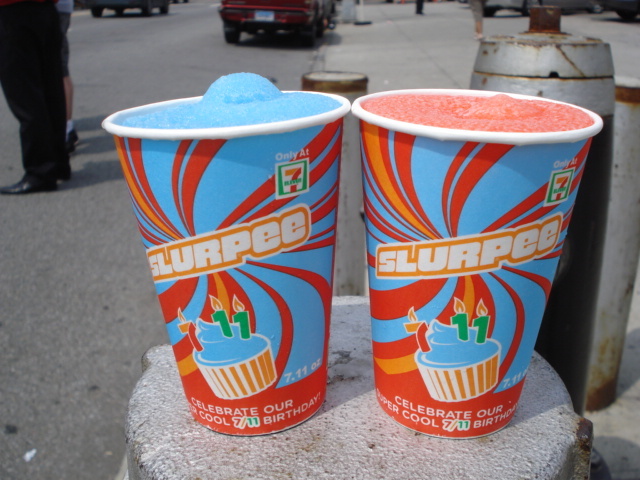 So anyways, into the store I went and I was a little surprised to see no clear and visible signage about the free Slurpees but when I inquired at the counter I was handed not one, but two small cups. 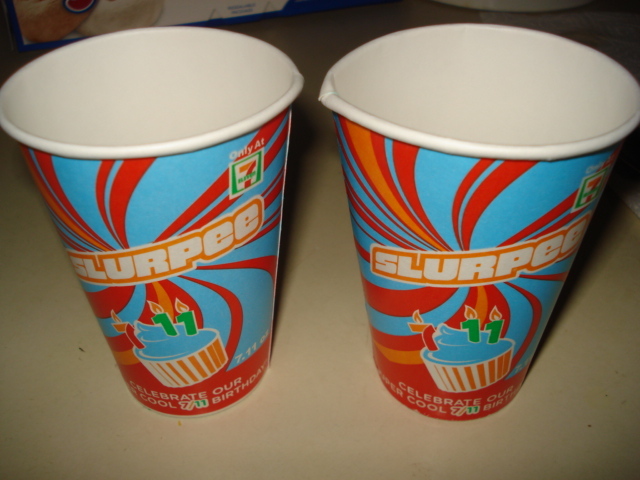 The size of those cups are nothing more than a tease, so I was glad that the clerk handed me two. It must have been my smile and friendly approach. That does work sometimes you know. With the upcoming Captain America movie coming out in a little over a week, I decided to go with a patriotic theme with my Slurpees. I poured one blueberry and one cherry. Of course I didn’t set them correctly for the photo purposes but like I said, it was 90 degrees in the shade. I managed to avoid a brain freeze somehow but as you can see via the next image these two treats did not stand a chance. Here is a better visual of the very festive cup. No, I did not keep them, but I did put them in the recycle bin. I think that is what I was supposed to do. Thanks to 7 Eleven for offering this little premium for their customers. It was the perfect day for it. Also thanks to my Dad for letting me know this was going on in the first place. I had no idea until I saw his email. Enjoy the summer everyone and try to stay as cool and as hydrated as possible. It’s for your own good.